Now why didn’t I do this a year ago? As it turns out, I had a rather crafty Thanksgiving weekend. My family has the same routine every year–on Thursday, we go to my dad’s parents, and on Saturday we go to my mom’s parents. 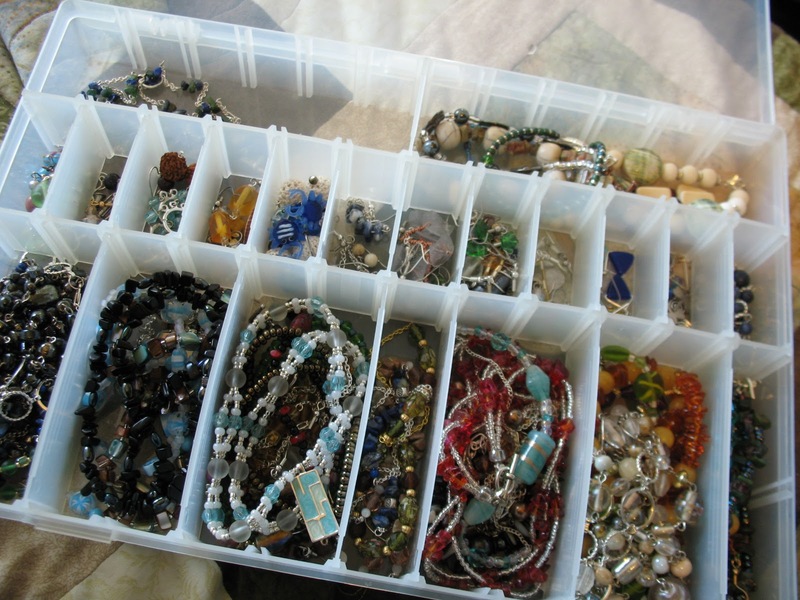 My dad’s side is a lot smaller/quieter, so I brought a box of beads and such with me and spent most of the non-eating time making earrings for the craft fair. My original plan was to do the same yesterday, but we also have a yearly tradition of decorating gingerbread houses (though now that the cousins are basically all adults, it’s just the girls that do it) and my gingerbread house was, shall we say, a little involved. So I did that the whole time instead. 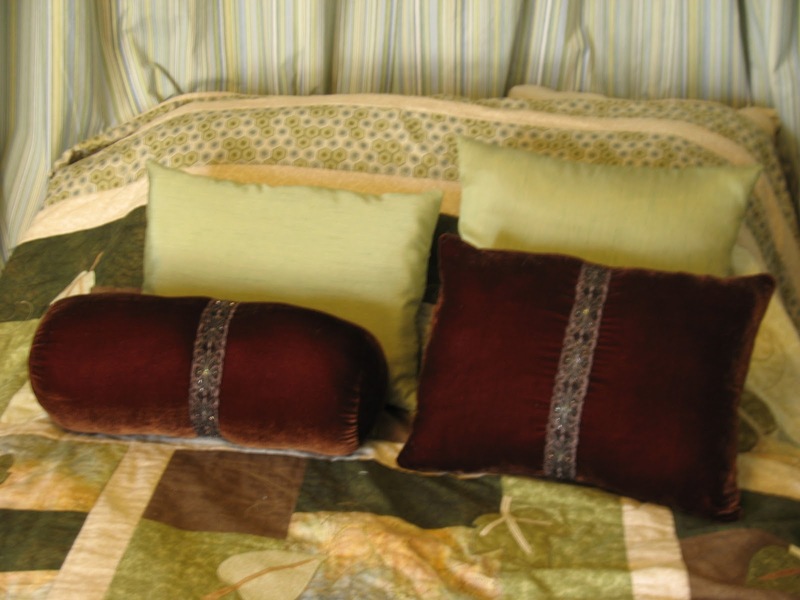 As for Friday, my friend Nicole came over and we had a pillow-making party! She’s making some as gifts for her nieces and nephew, and I’ve had some stuff sitting around for well over a year to make some for my ongoing room decorating project. We both had a rather productive afternoon…and I have to say that after that jacket, it was SO good to have a quick project! 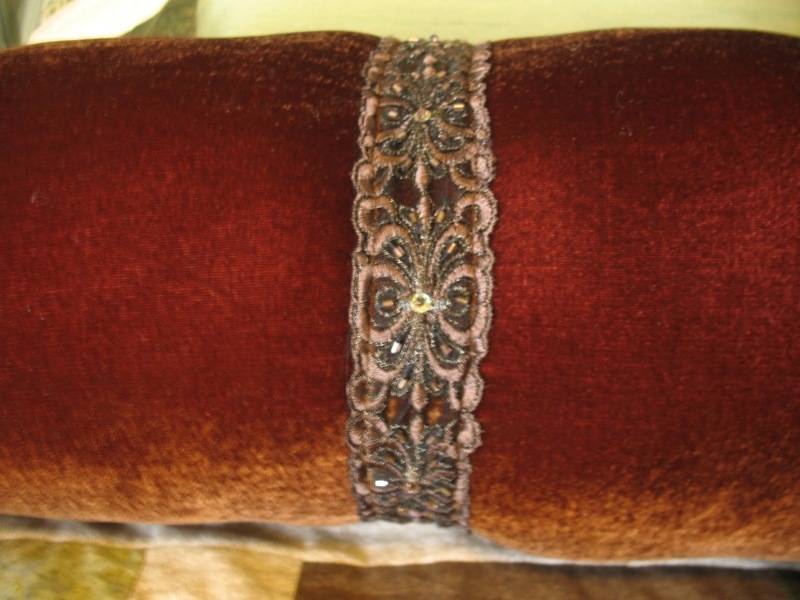 I know the velvet in particular is not going to stay this pristine-looking–but I don’t believe in pillows for decoration only, and fully plan on using them to shove under my head while I’m reading and such. And I think it’ll be cool to see how it changes as it crushes. Meet Donna 2.0! The old one served me well, but it did have its limits. And fell over a lot, since the base was rather unstable. And was constantly tilting to one side. So since a big overall goal for my sewing these days is improving my fitting skills, having one that stays still is a plus. And I think this one will be a little nicer to pin into than duct tape! I’m just getting started on figuring out the measurements– I know I’m going to have to do some padding for sure, because Donna’s a good bit flatter in certain areas than I am! But hopefully I can have all that sorted by the end of the month. In the meantime, I started the new jeans muslin tonight. And I have the backs of play capes embroidered and ready to go. And craft fair jewelry, of course. So hopefully, despite having a much fuller workload this week than last, I’ll find some time for crafting! Overall, I do like Blogger. But the one feature I wish it had, or if it does I don’t know it, is the ability to respond directly to a comment like you get on WordPress or LiveJournal. So here’s a 2-in-1. Gail asked what I’d be wearing yesterday’s completed project with, and Anoriell requested a pic of it on me. So here’s the visual answer to you both. The answer to Gail’s question: khakis, boots, and a brown tank top beneath the jacket in order to compensate for the combination of a shorter jacket and avoid any wardrobe malfunctions due to gaps between the snaps. And then here’s the closeup. Raising the neckline was definitely a good move, because this is perfect. But anyway, there it is. And I think I finished it just in time, because it doesn’t look like it’s going to be warm enough for perpetually-cold me to wear it again anytime soon. But it worked for today. Whew….I’ve literally spent hours over the last several days trying to get this thing done. And, as of about 10 minutes ago, it finally is. And since I’m too impatient to wait for natural lighting tomorrow, here it is. And the buttons. See how perfectly they go with the jacket? I couldn’t pass them up! I’m not 100% happy with the fit of it. Despite my tweaks, it still feels like it’s a bit tight across the shoulders. Not “I can’t move” tight, and I can still raise my arms to flute level just fine, but if I was trying to reach in front of me there would be some definite pulling. And I don’t think this is a jacket I’d make again, because it’s such a unique style. But this one’s been on my list for quite awhile, so I’m happy that it’s done! And it looks pretty good on me too, I think, even if the fit’s not perfect. 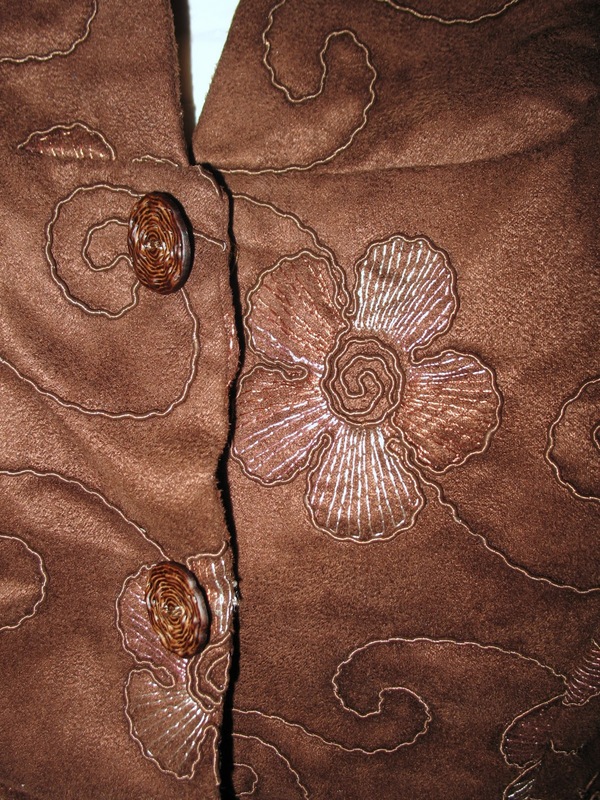 Progress on the flowery jacket is happening…I got the sleeves sewn together and am in the process of doing the Hong Kong seams. The facing is in. After bouncing some ideas off of my mom, I’ve decided that the buttons are going to be just for show and the actual closure is going to be snaps, since the embroidery is going to make any buttonholes hard. That, and I was checking the instructions in one of my sewing technique books, and it recommended no less than an inch long for a bound buttonhole. 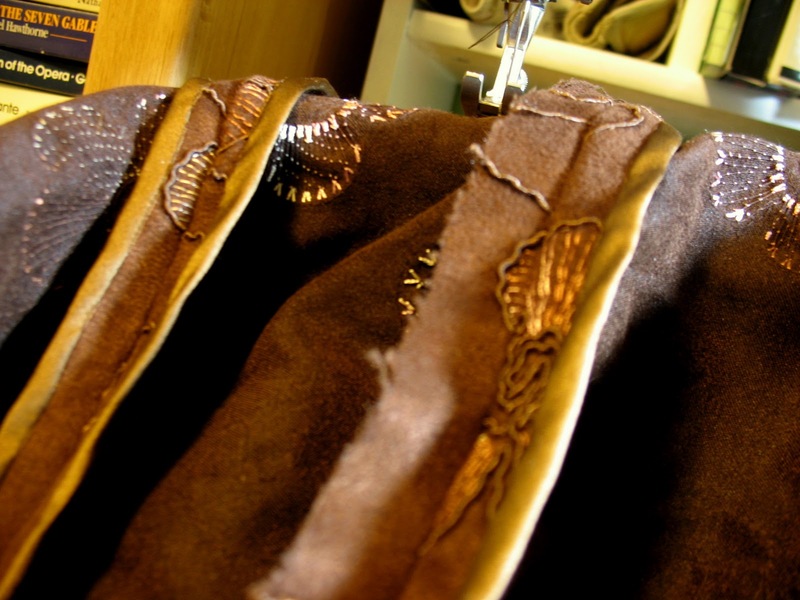 And of course the buttons I have, which match the style perfectly, are only 3/4″, so that won’t work. I was planning on wearing this over a camisole anyway, so there should be no wardrobe malfunctions with the snaps. I’ve also been sneaking in lots of jewelry making, since the craft fair is less than a month away. Eek! This is my box of all of my finished ones so far…. I counted them up this morning, and as of now, I have 47 pairs of earrings, 7 bracelets and 28 1/2 necklaces. (The half being one I started last night, and finally realized around 12:30 that I needed to go to bed when it was literally right around the halfway mark.) It sounds like a lot of earrings especially, but in typical fashion for me, a lot of the necklaces and earrings were made as a set. So now I’m getting to the point where I have a couple of very important things to figure out–how to package things up (nicely, but as cheaply as possible! ), how much more I should make (I’ve never done this before, so I honestly have no clue, though I’m thinking a few more bracelets would be good), and most importantly, how the heck to price these things! I’ve been doing some research, and it seems like the standard pricing formula is cost of materials + labor time x 2. Or even x3. The thing is, I’m looking at some of these things and thinking that there’s no way people would pay those prices! And while I have an Etsy shop somewhat set up and am planning on putting whatever I don’t sell in there (I know, I know, worst time of year to open a shop), it would be nice to at least sell something while I’m at the fair. At least I have some things figured out– I have printable business cards, and I was able to come up with a design for the Etsy banner and all based on that. I also have some ideas for how to do the actual packaging, which will also allow me to use up some of my cardstock and such. I just have to sit down and actually do it. It’s brilliant, brilliant, brilliant I tell you! Genius, I say! So now it’s just figuring out where to shop. The pattern calls for silk crepe-back satin, silk crepe, or silk jersey. I’ve found a couple of options so far. Fabric.com has a 55% cotton/45% silk poplin, that it describes as lightweight and with a soft hand. 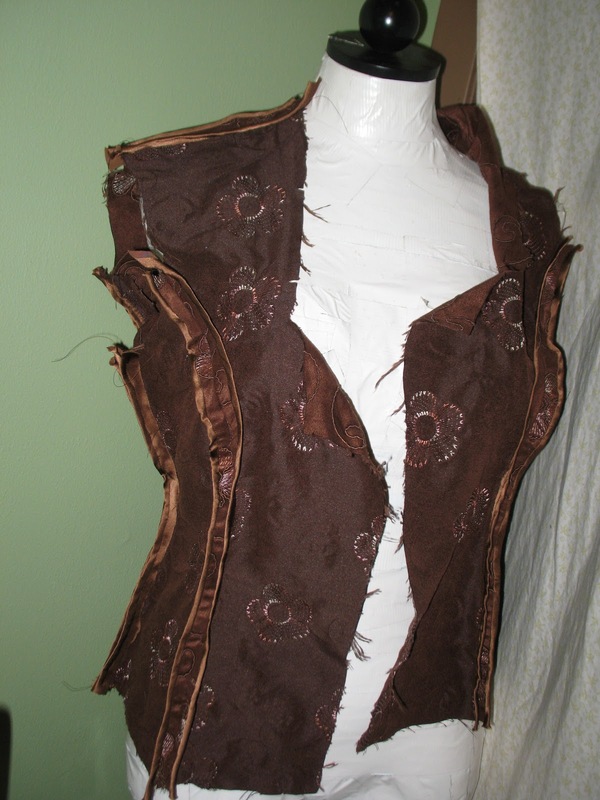 So that might have the drape that I need to pull off that ruching. I’ll have to get a swatch to see. I tried looking at Gorgeous Fabrics, but all they had was a navy color. Which won’t really work for if I needed to wear it for a concert where everyone else is wearing black. So then I checked out Mood and found that they have a 40% cotton/60% silk voile. But according to the fabric guidebook I got back in the spring (also by Claire Schaeffer– I think I’m a fan), that’s kind of a sheerish fabric….not quite what I had in mind. So those are my options so far. And did I mention that all of these except for the Mood voile are around half the price of the best-priced silk jersey that I’ve found by this point? Which I’m pretty sure was the $30-a-yard stuff at Mood. Wasn’t too thrilled at the idea of paying $90+ for dress materials….so if I go this route, I can afford lining! So what I said about the Hong Kong finish meaning this jacket would take me three times as long to sew was a bit inaccurate. It’s actually turning out to be five times as long, because I have to sew every seam five times! So after working on it for the past week, the current status of my jacket is that I have the front, back, side and shoulder seams done. That’s it. 😛 Though I am happy with how the finish is turning out. 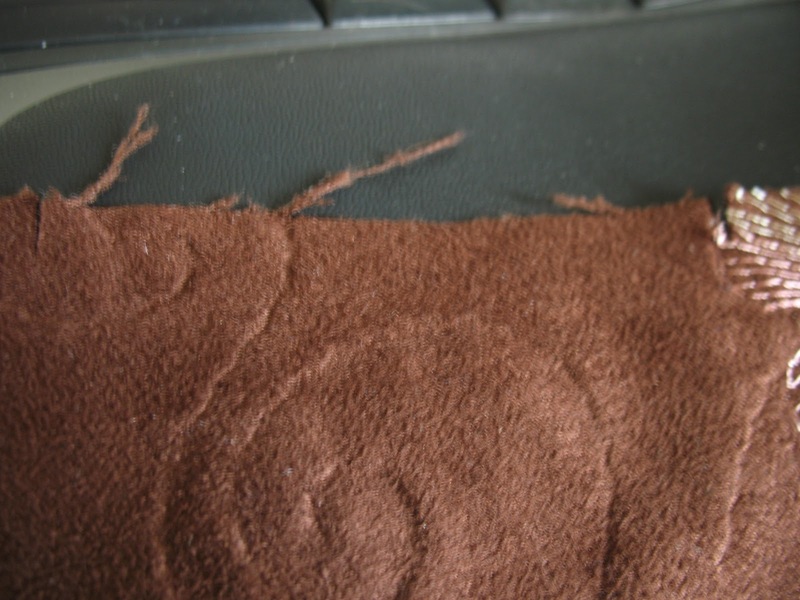 And it turns out that it’s a good thing I’m doing a bound seam, because for suedecloth, this fabric frays an awful lot! The other thing that’s taking a good bit of time with this is that I’m actually undoing the textured embroidery on the facings. It’s not hard to take that cording off, just a bit time-consuming. But since the nature of this jacket is going to make it be worn more like a shirt, more likely than not, I figured it would be more comfortable against my skin that way. And I still get a bit of the “print” from the lines that stay embedded in the fabric after removing the cording. I kind of like the look of it, actually. Subtle. Another challenge with this jacket is that for some reason, this fabric does NOT want to press right. I don’t know if it’s because the Hong Kong finish means I didn’t clip a single seam, but they are not lying flat. At all. I even tried turning the heat on the iron up all the way (with a pressing cloth so I didn’t melt the fabric), and it’s still got a bit of an “I didn’t bother to iron this at all” look. That bugs me, but I’m not sure what else to do with it. I’m hoping I can make some good progress on this tomorrow–things are a bit slow at the garden center in November, and as a result, my hours got cut back even more. So the only day I was scheduled this week was yesterday, and that means I’ve got some extra time on my hands tomorrow. One thing I have done that’s helped is that my sewing machine is currently sitting right next to my computer. So that means I can skim through emails or blog posts while I pin seams, and makes my time somewhat doubly productive. (Or slows both down, but I feel better about doing something else while I’m sitting in front of the computer. Plus then I can just sew for ten minutes here or there where I normally wouldn’t.) 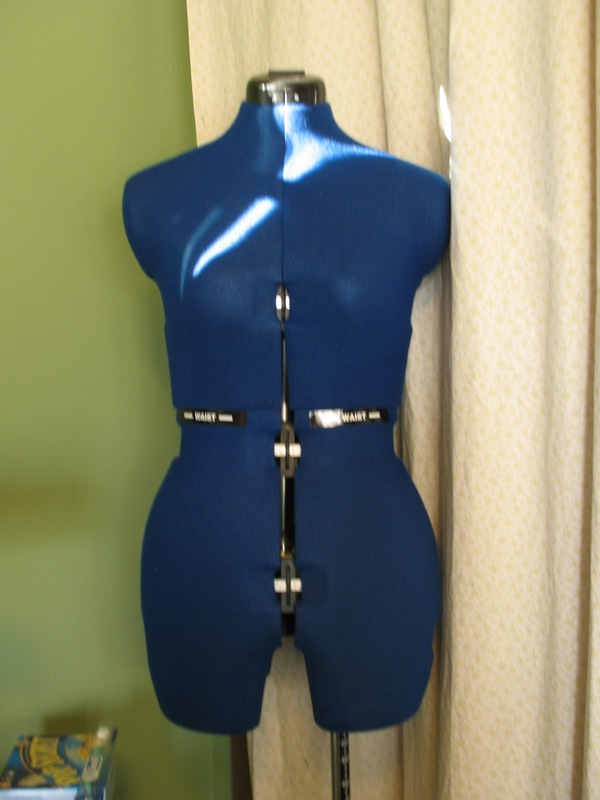 I’ve also decided that my next sewing project is going to be a quick job, to make up for this one! But I’m hoping it turns out well. It’ll ease the pain somewhat of how boring the Burda magazine has gotten. Seriously– there was nothing in it that I liked this month. Everything was just so shapeless and blah, and I was highly unimpressed. 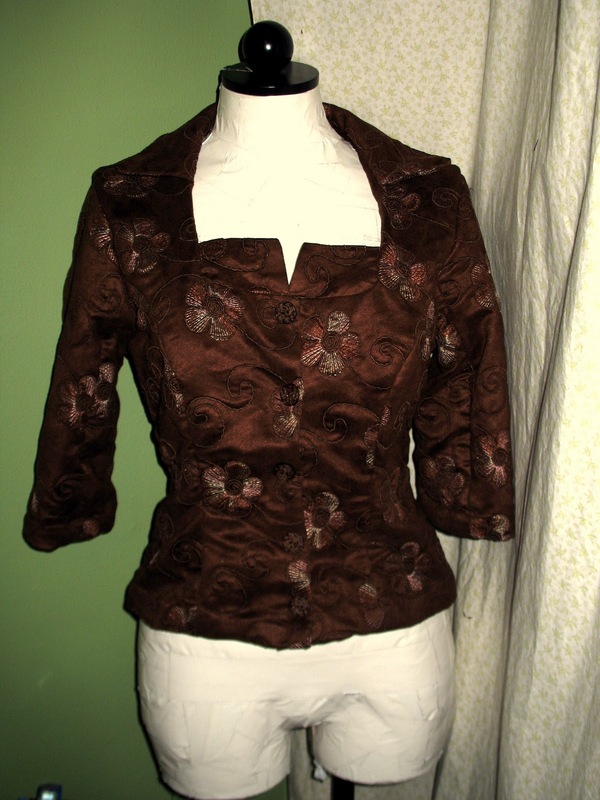 And the one jacket that I sort of liked, it was really nothing that I haven’t seen before, and there were no standout details to instantly put it on my must-sew list like the jacket I’m currently making. At least the debate is settled on whether I’m going to renew my subscription once it runs out–not happening. If I like something enough, I’ll just buy the individual issues at Barnes & Noble, or download individual patterns from the website. On a somewhat random note, apparently my last post was my 500th and I missed it. I should probably do something about that. But it’s going to have to wait….I just haven’t had a chance to think of any cool giveaways or anything yet. And I have to run, because I’m going to a concert tonight and am supposed to leave to meet my bestie…um, now. 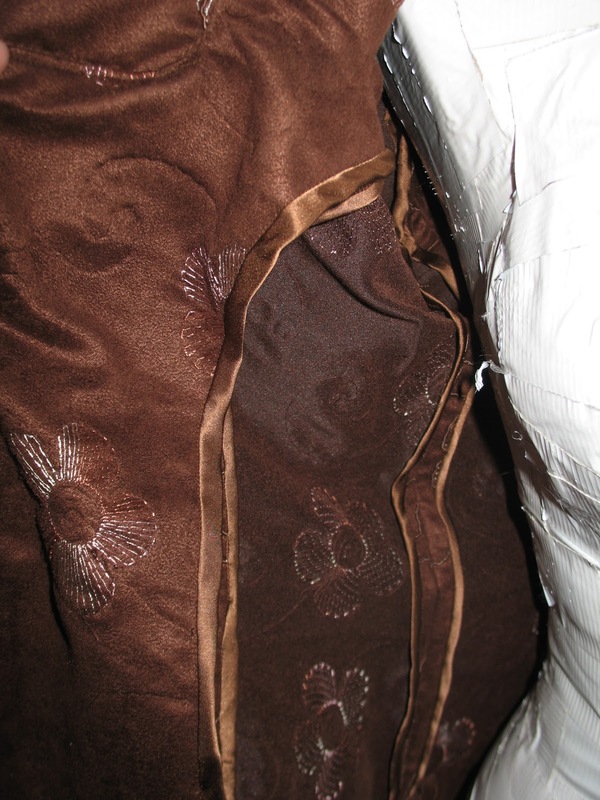 Check it out– my first Hong Kong seams! I’d decided that I wanted to leave the Burda jacket that I’m currently working on unlined–with the style it’s in, it’s the sort of jacket that can never really be worn over another shirt (at least one that’s showing above the neckline), and so I’m making it with the intent of wearing it more as a buttoned-up shirt of sorts. But I wanted a nice finish inside, since it would be showing. 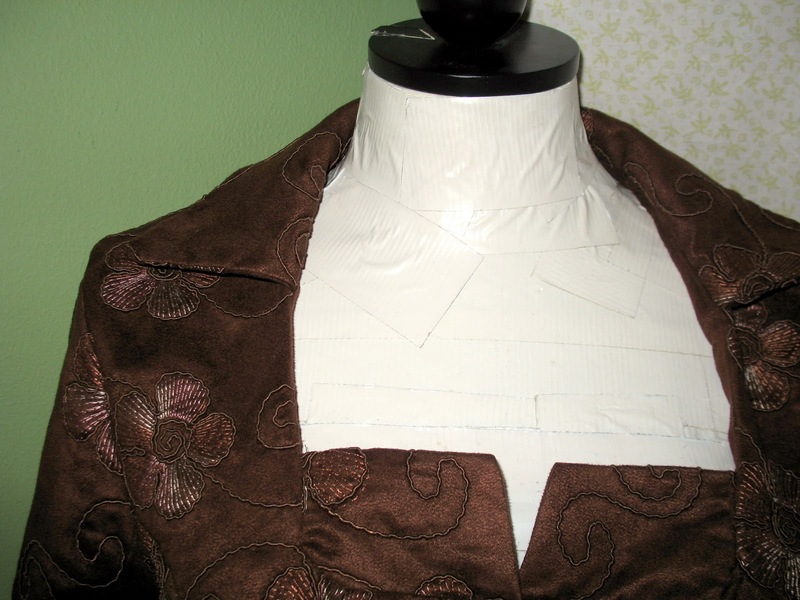 And this seemed like a practical one, since it would help tack down the embroidered cords that go off the edges. So far, I’ve discovered that it’s working better to move the needle over a notch closer to the edge of the foot– I like the more narrow seam finish better. And I’m finally getting to use up some fabric–I cut the bias strips from fabric left over from the charmeuse dress of fail. (The pieces were too large to toss, but not quite enough to make any other garment out of. 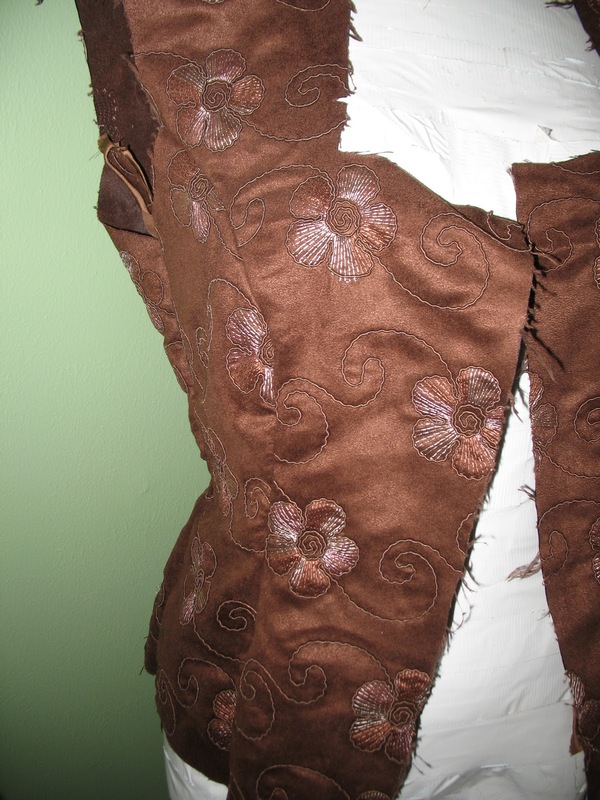 Unless I do some crazy draping experiment with a camisle…But bias strips work too, and at least this fabric is good for something. I like the look of it quite a bit so far, and am trying to ignore the fact that this jacket is going to take 3 times the amount of sewing time it would otherwise. In other news, I’ve been working quite a bit lately on upping my inventory for the craft fair–worked on that basically all day on Saturday. Just over a month to go, yikes!